I drew where I was going to cut according to Larry’s templates. 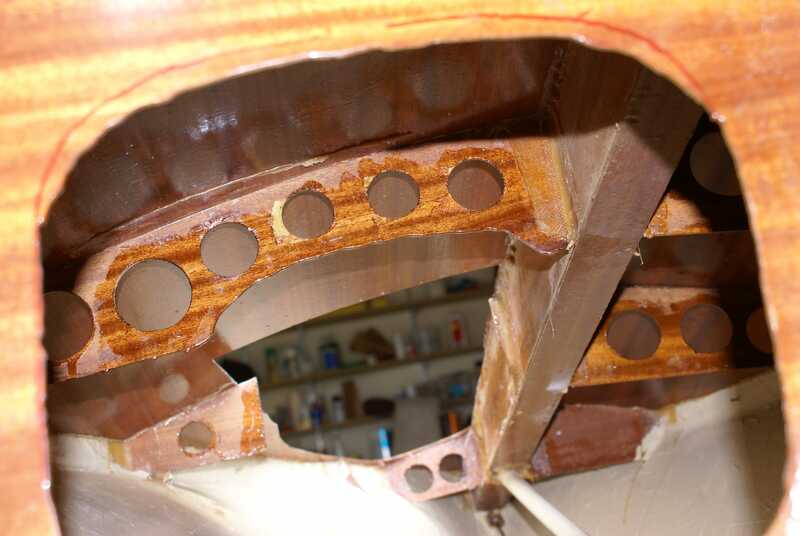 On the foredeck, I first cut a smaller hole to make sure I wasn’t going to run into the beam, then the bigger hole. 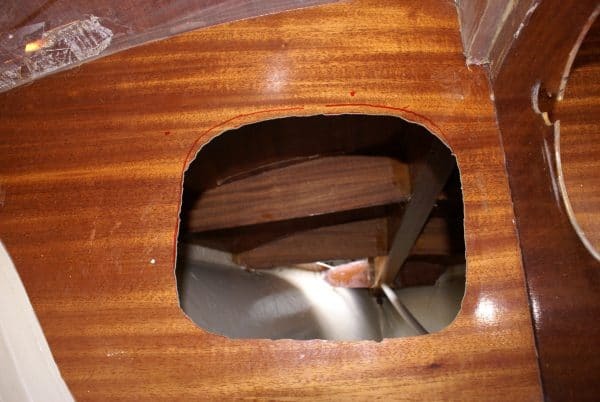 I was somewhat surprised that even though Lindsay Boatbuilders cut fancy lightening holes in every visible plywood structural member, they did not cut lightening holes in those under the foredeck! (Remember this for later). I fit the launcher parts and epoxied the two parts together. 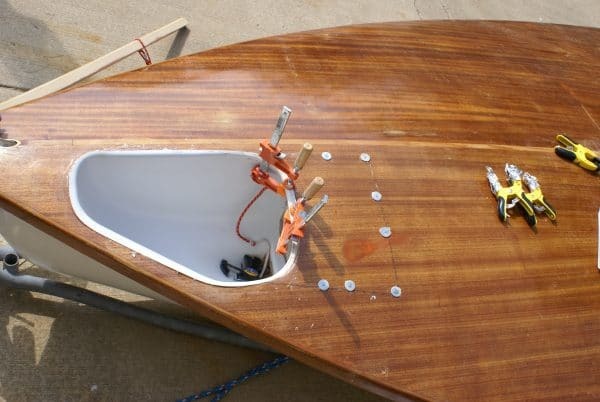 Note that with the thin foredeck, the lip of the launcher sits on top of the foredeck and not flush as it would with a cored foredeck. Note also the sn the screws. Put the screws through the holes, screwing them into the plywood. I used #2 wood screws (very small), and washers. I screwed them tight. This ensured that at least where the screws were there is good bonding between the two tube sections. This was all of the flat runs. There was some lifting at the corners. I cut the rectangular section behind the launcher following Larry’s instructions. 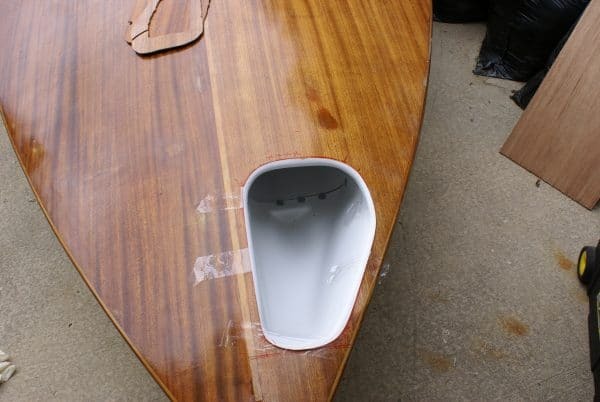 Note that I had to cut through a foredeck support rib. I saved the rib. I used a Dremel with the thinnest cutting wheel to make these cuts. It is much more time consuming than a jigsaw but leaves a much thinner slot. I removed the launcher tube and wrapped the outside following Larry’s instructions. I filled and faired the inside at the joint. I used hole saws to drill lightening holes in the ribs. I sealed the cut edges with epoxy. 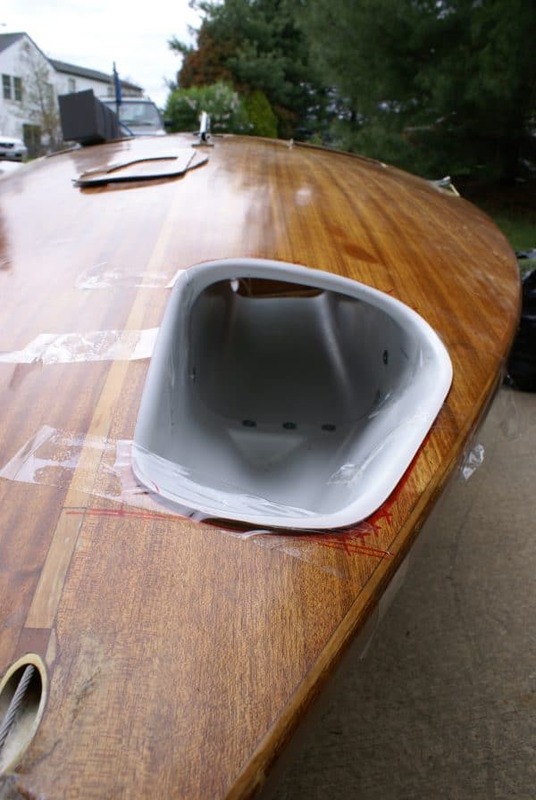 Note the forward-most rib on the port side. It did not exist, I added it right at the front edge of the launcher tube. 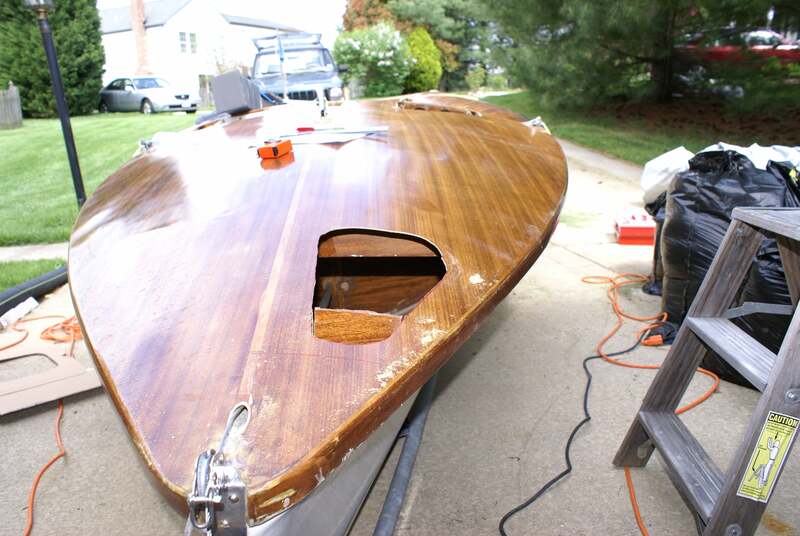 It supports the deck at the front edge and replaces the rib that was removed from a few inches back. I put the launcher in and added the drain tube. I deviated from Larry’s instructions here. 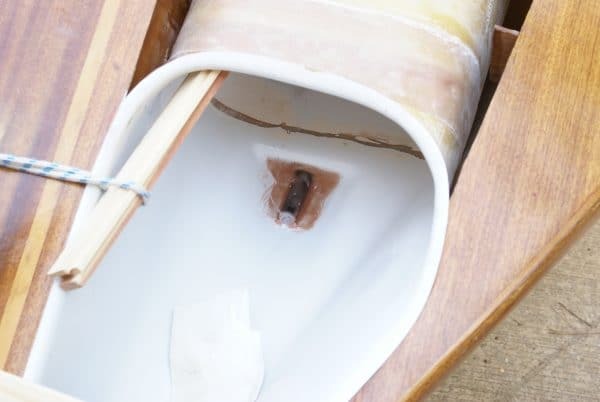 He sends a plywood strut to hold the drain tube. I did not use it. Also, he sends a PVC tube, which I didn’t like, so I got a fiberglass tube (I did not expect it to be black when I ordered it). It is somewhat smaller in diameter, but not much. I drilled a hole in the drain well and in the bulkhead, slid the tube in, and glassed it as shown inside the launcher tube. The glass-wrapped over the drain tube. The scrap wood and rope were there to hold the assembly in the right place. I waited for the epoxy to cure then removed the assembly. I added some more glass on the outside to stiffen the drain-tube/launcher connection. I put the assembly back in. 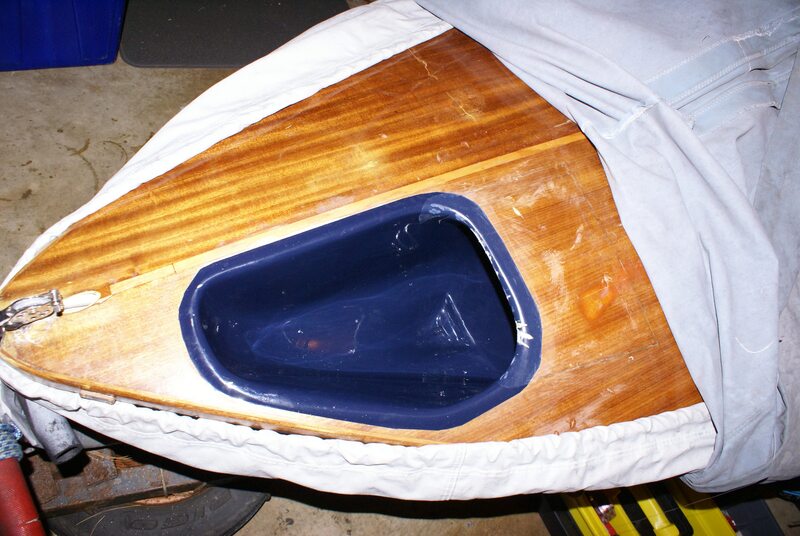 I reinstalled the aft rib. I just spliced it using a scrap piece of plywood. Also, I epoxied all of those little scrap pieces you see around the edge of the rectangular cutout, to support the deck piece when I put it back. You do have to cut the rib to fit over the launcher tube. I set it up so it is touching the tube and added some epoxy and glass to hold the tube stiffly. I epoxied the launcher to the foredeck. 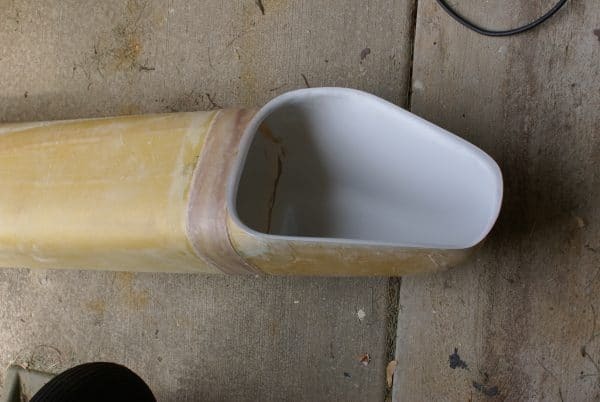 This was tricky because the Lindsay shape is not quite the same as the Waterat shape, so the lip of the launcher tube needed to be flexed to make good contact. Unfortunately, I did not take a picture of what I did to get maximum contact between the two. This picture is right at the start of the process after I put the epoxy in and tied the one piece of scrap wood across the front edge. I continued tying pieces of wood to apply pressure to the lip of the launcher almost all the way around. There were at least three 2x4s across the mouth of the launcher, and a rat’s nest of lines strapping them to the dolly to apply pressure. I reinstalled the cover for the rectangular section. The clamps were there to flex the lip of the launcher tube so that it was flat against the plywood. The screws each go into one of the little scrap pieces shown above. With the big washers bridging the gap, I was able to get the plywood perfectly flush all the way around, so when I refinish the foredeck I can just sand right over the joint. 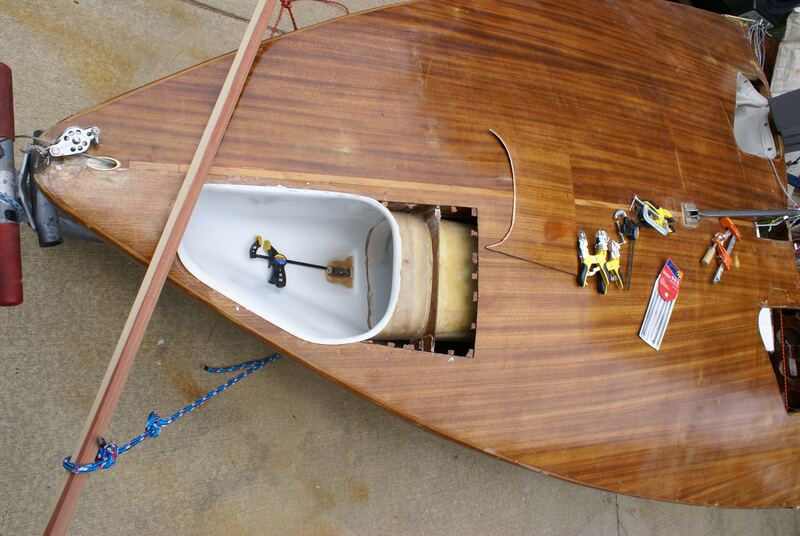 You can also see in the above picture where the lip is nice and flat against the plywood and where it is not. Basically, it is easy to get it flat on straight runs of the launcher tube mouth, and hard at corners. So, the three long straight runs are flat, and all of the corners are slightly lifted. I then used microballoons and epoxy all the way around the outside on top of the plywood (sorry, no picture), and sanded it down. You can actually sand the lip pretty hard at the corners because it is glass and not Kevlar, so it does not fuzz up. I made the lip at the front significantly shorter by just sanding it away. I also don’t have a picture of fairing the drain tube in. I filled most of the little well with epoxy and microballoons, completely covering the drain tube. Then I roughed it out with a dremel, and smoothed it better with some hand sanding. It took a while but came out very well. I painted using Interlux bootstripe blue (it is darker than this picture, which is overexposed so you can see the drain tube joint). It is available in very small cans. I sprayed it. Actually, I brushed first then sanded most of it away because it was so crappy. Then I sprayed, and it came out great on the first shot, with one coat. This paint is pretty easy for a novice to spray. This picture was taken after a season of sailing. The three white fingers at the port, aft edge of the mouth happened when we launcher-newbies ran over the kite and the spin-sheets rubbed back and forth there while we were sorting it out. The halyard also rubs some paint off, you can just barely see it in this picture at the aft inboard edge of the mouth. Now we have some clear tape there. You can see that the screw holes were small enough that they are barely visible, and the slit is pretty inconspicuous as well.